Why Should You Invest in Egypt? The political events of the Arab Spring triggered a severe down-turn in the Egyptian economy, especially as foreign companies withdrew from the country and closed their affiliated branches. The Egyptian government responded with a variety of policies aimed in part at attracting foreign and domestic investment. The government exerted remarkable efforts to have the new Investment Law (no.72 of 2017) promulgated. The Investment Law attempts to improve the climate for foreign direct investment. It removes previous constraints such as those on the repatriation of dividends, wire-transfers of hard currency, purchases of imported goods and foreign exchange currency conversions, alleviating concerns that foreign investors would be unable to remove their funds from Egypt. We summarize here the new incentives introduced by the Investment Law, and explain how they follow the benefits created by the former Egyptian Investment Law. Under the new Law, starting an investment will be exempted from stamp tax, most governmental expenses, and land/property registration expenses. More importantly, the Law stipulates that customs on all equipment and materials required for the manufacturing and establishment of investment projects will be decreased and unified at a rate of 2%. Article 11 of the Law outlines tax exemptions. The exemptions vary depending on the area in which the investment project is established in accordance with the investment map (see below), the importance of the project, and the significance of the used manpower. A deduction ranging from 30% to 80% of the investment costs will apply. The term of investment cost will be defined and explained further in the Law’s Executive Regulations (which are yet to be published). Moreover, projects established in accordance with the abovementioned Article 11 may be entitled to establish customs ports allocated solely for such projects, to facilitate the importation and exportation process. Further, the Egyptian Government will be responsible for the payment of any infrastructure costs connecting facilities to the real property allocated for the project. In addition to such costs, the government will pay back half of the real property’s value to the investor, in case the latter commenced the production within 2 years from the date of handing-over of the said property. In case the project has any strategic features, the allocation of the real property may be free of charge. Not to mention the Government’s payment of part of the manpower’s training’s cost. The Law allows for the appointment of 2 expatriate employees for every 10 Egyptian employees after certain conditions are met, such as the unavailability of suitably trained national manpower. This is an exception to the provisions of Egyptian Labour Law which stipulate that the ratio of expatriates to Egyptian employees must be 1 to 9. There is an exception to the foreigner-native employment ratio, which can be applied if the investment project is of a sufficient size and importance. In such a case, there will be no maximum limit on the number of non-Egyptians who may be employed. The forthcoming Executive Regulations will likely further explain the criteria and conditions of the projects that fall under this exception. On the other hand, the Law prefers Egyptian manpower to foreign expertise, and it requires investors to provide Egyptian employees with suitable training. Moreover, the Law provides that the foreign investor will be provided with a residential visa in Egypt, which will be valid during the term of the investment project. The Law does not provide a maximum term limit for a residential visa. The Executive Regulations may in future set the limits and conditions, if any, to this provision. The concept of an investment map was first introduced in the former Investment Law (no.8 of 1997), but was removed afterwards. However, in practice, the Industrial Development Authority directed investors towards industrial zones where similar activities were based. The new Investment Law revives the investment map concept. The map will be structured on the strategic needs of industries and will be organised into geographic zones. In order to ensure the map keeps up with investment needs, it will be revisited and updated periodically, and within a maximum of every three years. In order to assist areas in need, the Law has been keen to facilitate the procedures for procuring land/real property in order to establish investment projects that satisfy the needs of a particular community. This is to be handled through the Investors Service Centre established at the General Authority for Investment. Furthermore, depending on the type of investment project and how necessary it is, the Prime Minister is entitled to issue decrees allocating certain plots of land/real properties for certain investment projects in particular, such as infrastructure projects, renewable energy projects, and projects to be completed through a public-private partnership. In these circumstances, no further procedures are required in order to procure the land/property after the issuance of such decrees. The Law also encourages investments in the fields of telecommunications, electronics manufacturing, technology and all related activities, whose details will be published in the Executive Regulations issued soon. Subject to the further details, importing required materials and equipment for the establishment of investment projects will also be exempted from taxes and customs. Likewise, the newly established technological zones will also be subject to the special tax benefits and incentives listed in the Law. With respect to free zones, they are established in Egypt by virtue of a Law. The Prime Minister may allocate a free zone for certain particular projects having an exportation objective. Once an investor is granted with a license to establish its project in a free zone, the investor is enabled to enjoy incentives and benefits, without the need to be registered at the Egyptian Industrial Registry. In a free zone, an investor may obtain a usufruct right on the plot of land on which the investor will establish the required manufacturing facility and/or any required real properties. Establishing a project in a free zone enables the investor to be exempted from the applicable customs procedures, importation and exportation regulations, value added tax or customs tax. Moreover, any required materials, equipment, supplies and transportation means (except for passenger cars) for engaging in the activity of the investment project are exempted from customs tax, value added tax and other taxes and expenses. Additionally, projects established in free zones are exempted from applicable expenses and tax regimes applicable in Egypt. In order to further assuage investor concerns regarding the Egyptian authorities, the Law maintains the same guarantees as the previous law did. It promises investors that government authorities will not be entitled to nationalize investment projects, expropriate them unless under certain fair compensation and conditions are met; and freeze or seize or impose guardianship except by virtue of a court order. Furthermore, administrative authorities are not entitled to issue any decrees adding any financial burdens onto the investor, or cancelling any permit without seeking the approval of the General Authority for Investment. It should be noted that the privileges, tax exemptions, incentives, and guarantees stipulated under legal regimes prior to the promulgation of the Law are maintained until their expiry and are not affected by the issuance of the Law. Since the Law is completed and interpreted by its Executive Regulations, it becomes practically enforceable upon the latter’s issuance. The Law establishes an arbitration and mediation centre that may be competent to settle any potential or existing investment related dispute, if it is expressly chosen and agreed upon by the involved parties. The Law also establishes grievance committees in the General Authority for Investment that will be tasked with deciding on challenges related to refusals to grant approvals or license decisions, whether such challenged decisions are issued by the General Authority for Investment or any affiliated administrative authority. These committees will be headed by judges. As for litigation, a ministerial committee will be formed for the purpose of settling any disputes arising between investors and any administrative authority or public sector entity. Another ministerial committee will be formed to solely settle contractual disputes entered into between investors and public sector entities. Although the Law stipulates dispute resolution mechanisms, recourse to courts remains guaranteed to all investors, whether foreign or local. The promulgation of the Law is an undeniable governmental achievement that will be completed by the issue of complementary laws such as the Executive Regulations interpreting the Law, a new Competition Law, bankruptcy regulations, and regulations on the safe exit from the market. 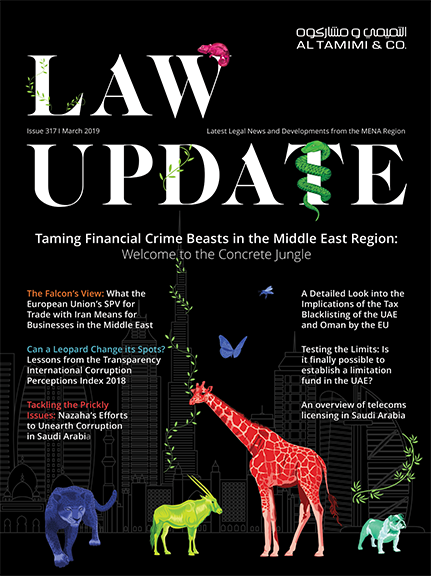 The Investment Law is considered a major step in the fertilisation of the Egyptian investment climate that has long been seen as excessively bureaucratic and barren. The Egyptian Parliament is currently debating the content of the proposed Executive Regulations. We await the outcome of the legislative process and look forward to the embedding process of this new and exciting framework for investment in Egypt. Al Tamimi & Company’s Corporate Structuring team regularly advises on large multinational companies investing in Egypt. For further information please contact Ayman Nour (A.Nour@tamimi.com) or Farah El Nahas (F.ElNahas@tamimi.com).